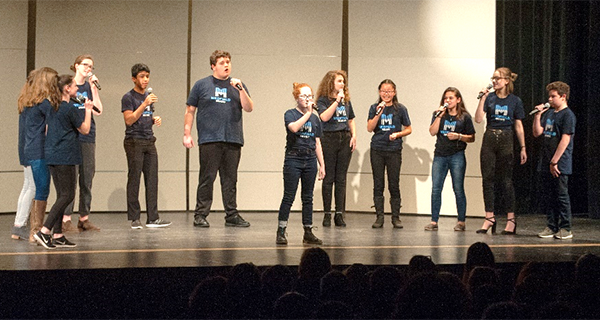 Medfield High School’s SoundWaves and four other high school a cappella groups, including Westwood’s Passing Notes and Needham’s Fermata Nowhere, amazed the audience at Medfield High School’s A Cappella Night on Friday, March 29, at the school’s Lowell Mason Auditorium. They were joined by the accomplished Medfield Jr. Jazz Choir and the award-winning Northeastern University’s Nor’easters. A Cappella Night was no ordinary school music concert. Students from all the participating schools filled the audience. There was a palpable excitement in the air as the crowd waited for the music to begin. A combination of pep rally, music competition TV show, hip-hop dance, and social occasion, this show featured intricate vocal harmonies and rhythms, self-directed student groups, stomping and dancing, choreography, heartfelt performances, and outstanding soloists. The evening was hosted by “the Two Mikes,” Michael Koellner and Michael O’Leary. 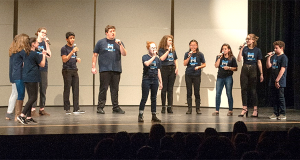 Both talented singers and members of Medfield’s SoundWaves, they greeted the audience at the start of the show and introduced each group with comic reflections and clever word play. The Two Mikes worked nicely together to set the fun and celebratory tone of the night. The first high school group to perform, Westwood’s Passing Notes, was seen prior to the concert at Brothers Market in Medfield Center, grabbing some dinner and confidently offering a song for the customers’ delight. In performance, they treated the crowd to beautiful, intricate harmonies and rhythms in “Dangerous” (arr. By Adeline Vamenta, opb Big Data) and “Can’t Help Falling in Love” (arr. Pentatonix, opb Elvis Presley). In “Africa” (arr. Bryan Sharpe, opb Toto), the soloist wove a tale with his powerful voice over the lush background of sound and rhythm. The second high school group, Natick’s Scalestorm, opened with an exciting performance of “Somebody to Love” (arr. Madison Gaudet and Alexeya O’Brien, opb Queen), which featured a powerful soloist channeling the vocal power of Freddie Mercury. This group used choreography to further interpret the music beyond their voices. They also performed a lovely “All Good People” (arr. Lisa Forish, opb Delta Rae) and a snappy “Signed, Sealed, Delivered, I’m Yours” (arr. Deke Sharon, opb Stevie Wonder). ‘The Two Mikes,’ Michael Koellner and Michael O’Leary, host A Cappella Night, which brought together groups from Medfield, Westwood, and Needham, among other towns. Next, Medfield’s Jr. Jazz Choir performed “Brave/Roar” (arr. Brittany Griffith, opb Sara Bareilles/Katy Perry) with sophistication and styling. Congratulations to the youngest performers for rising to the occasion with their talent! The third high school group, North Reading’s NOTEorious, utilized enthusiastic choreography to highlight their fantastic singing. Their green and blue outfits created a unified stage presence. This group emphasized entertaining as a unit and delivered a polished performance. Their songs, “Legend/Just Like Fire” (arr. NOTEorious, opb The Score/PINK), “You Are the Reason” (arr. NOTEorious, opb Calum Scott), and “Burn It Down” (arr.NOTEorious, opb Linkin Park), were energetic and heartfelt. 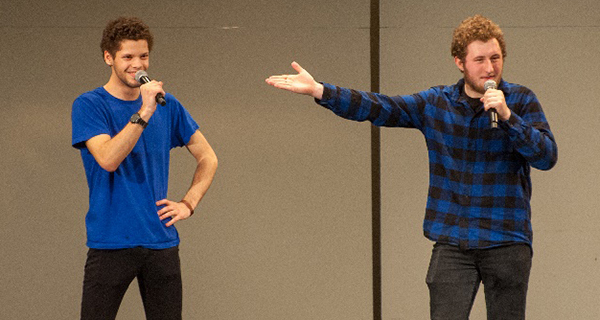 Before intermission, there was a beatbox contest. Four vocal rhythm performers delighted the audience with their 30-second freestyle performances. How is it possible that they can create such a variety of sounds while maintaining a such a steady, pumping beat? After intermission, the fourth high school group, Needham’s Fermata Nowhere, flexed their girl power with “Symphony” (arr. Maya Osman, opb Zara Larsson) and “Uninvited” (arr. By Linda Perlman, opb Alanis Morissette). Their voices blended beautifully, and they poured genuine feeling into their performance. A girls’ group, their sound was lighter and more lyrical. The fifth high school group, Medfield’s SoundWaves, enjoyed the home team advantage. They were greeted by loud cheers and applause, and they did not disappoint their devoted fans. They blended their voices beautifully and added dancing to embellish the music. In their songs, “I Need Your Love” (arr. Ben Bram, opb Ellie Goulding and Calin Harris), “September” (arr. Ben Bram, opb Earth, Wind, and Fire), and “Africa” (arr. Bryan Sharpe, opb Toto), the soloists were confident and expressive, and the backing vocals and beats complemented them well. Finally, Northeastern University’s Nor’easters delighted the audience with accomplished singing, dancing, and outstanding soloists who really knew how to deliver a song with great impact. They performed several of their repertoire songs, and also some newer ones they were just starting to perform. The Nor’easters were a great example for the high school groups to follow. The group encouraged the high school groups to continue to sing in college and enjoy their love of performing, even if they are not music majors. All the groups that performed showed a great deal of talent and the willingness to work hard to learn and perform complex music. The a cappella style requires a strong independence from the singers, while also demanding a lot of skill to blend their individual parts into the group. The students’ energy and love of music in their heartfelt performances was exciting, encouraging, and hopeful. What a fantastic and fun way to enjoy music and socialize with like-minded students in such a positive endeavor.